Published in the Dover Express, 18January, 1980. Townwall Street, adjoining Bench Street, partook of the improvement made in that thoroughfare and in New Bridge in 1836 and 1840. The houses which stood on the seaward side of Townwall Street, next New Bridge, before the street became a dual-carriageway, construction of which meant demolition of quite a few business premises, were of older date. No. 1 Townwall Street and No. 2, were built in 1779. Mr Thomas Pattenden, who resided at No. 1 in 1779, had a charming picturesque flower garden running down to the river. In No 2, resided Mr Boyton, and later it was the office of Mr Thomas Fox, Clerk to the Board of Guardians, and a lawyer of some note about 1860. The houses of Nos. 6 and 7 originally had their backs to this thoroughfare, and were evidently built to command a sea view, which the erection of Camden Crescent destroyed. There used to be rustic bridges over the river to the beach. On the land side are Messrs J. B. Terson and Son’s Auction Rooms, and there used to be Mr J. D. Terson’s printing office. A little higher up the Town Mill, which was supposed to date from the Conquest. No doubt the mill mentioned in Domesday Book must have been situated hereabouts. That mill was built by one Herbert, by permission of the Bishop of Baieux, "near the entrance into that haven," and it is said to have been a hindrance to ships entering the harbour, and that it was an injury to the King and his subjects. It is supposed to have been a tide mill, and that by reason of its narrowing the tideway up to the haven, which was then on the east side of King Street, it was a nuisance from its first erection, and must have remained so as long as boats continued to go up the river. When the Bishop of Baieux was banished by the Conqueror, this mill reverted to the Crown, and continued to be Crown property until modern times. In a modern reprint of the Domesday Book the editor, Sir Henry Ellis, suggests that the Dover, mill which caused so much damage may indeed have been a tide mill, driven by water running on the ebb from a dam which had been filled on the flood. But other authors have held that there is no direct evidence in Domesday that tide mills existed in England so early. If they did Dover may claim two distinctions—it possessed one of the earliest tide mills and had the earliest recorded tower windmill. This was at Dover Castle and was built in 1295 in the time of Stephen de Pencester, Constable of Dover. One of the towers of the castle, known as Valence Tower, was converted into a windmill to grind flour for the garrison. A record of the mill describes the structure as being built of stone and the site has been identified as the edge of a spur of ground about 250ft. south of the castle church. The bill of works for the conversion survives in the national Record Office. The windmill adjoined another castle tower known as Clinton Tower. Both structures have long since disappeared. In front of the mill, abutting on Townwall Street, was the Fish Market, built in 1831, standing over the river. It remained there till a new fish market was built in 1862. Here, too, was the butcher’s quarter. The Butchery Gate, with the adjoining Standfast Tower, stood over the river, on the opposite side of the road to this mill. It was pulled down in 1819. In the 18th century it was used as a prison, and in its last days as a Watch House for the police of those days. 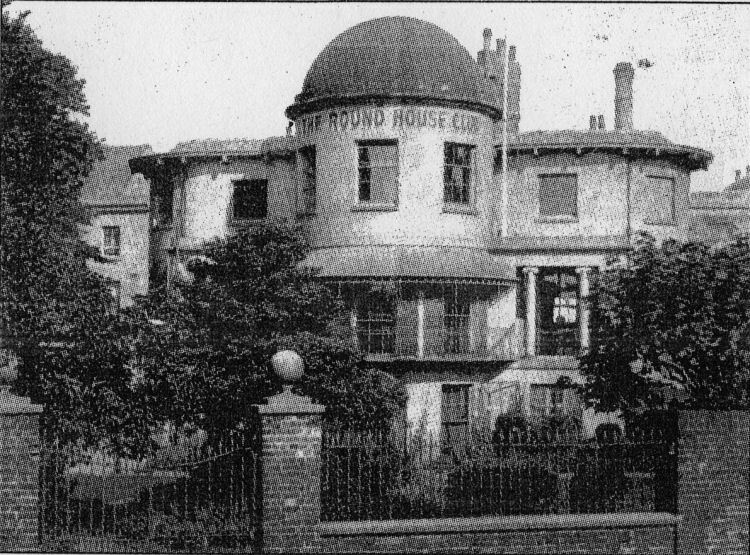 The Round House was a striking feature of Townwall Street. It was built about 1805 by Mr John Shipdem. It stood alone on the shore with a pretty, garden towards the sea, although the erection of later marine residences gave it a back seat. The style of architecture was curious, with its Moorish dome and bow windows and curved sides. Mr John Shipdem was the leading lawyer in Dover at the beginning of the 19th century, and an important public man. He was town clerk from the year 1791 till 1826, and was Register of Dover Harbour from 1806 down to about the year 1840. For a number of years it was the residence of the Rev T. Shipdem Frampton, but on his death in 1923 it was sold, and passed out of the family. The premises were later the home of various social clubs. The building survived until some time after World War II. Above photo showing the Round House. Long before Mr Shipdem’s house was built—nearly 200 years earlier—there was a bridge at this spot over “The Little Pent,“ a sort of back water of the river, which lay in a depression between the shingle ridge and Townwall Street. A minute of the Corporation of March 1618, ordered that “a new bridge be built over the Little Pent, both sides to be made with good and sufficient hewed stones, of which as many as may be convenyently found fitt to be taken out of the walls of the decayed Church of St Martin, in the said towne, with a drawbridge in the centre.“ It was over this bridge that Henrietta of France was carried in her litter when she met Charles I at Dover Castle, and over this same drawbridge came Charles II and his followers after his reception on the shore by the mayor and Corporation at the Restoration. The passage to the shore existed in 1737, and was then called Buggin’s Bridge. In Victorian days, Townwall Street had many stables and coach houses. On the south side was a wall abutting on building land between Townwall Street and Liverpool Street, which remained unutilised for a century — a curious instance of the potentiality of wealth being ignored. In 1910, a Folkestone entertainments organiser started business there, and called the place “The Guilford Gardens.“ During the war a YMCA building was erected there, and it was later continued as a YMCA Club. This part of Townwall Street is very near the seafront, yet was entirely cut off for want of a crossroad. When the Paving Commissioners carried their Bill through Parliament in the year 1835, for' widening Bench Street and forming Castle Street, power was taken to make a road from Castle Street to the seafront, crossing the vacant land, but the formation of Russell Street was all that was accomplished. A remarkable view of a particularly industrious part of Dover at the turn of the century. Taken from the hills above Adrian Street this plate camera photograph gives a roof-top view over the Unitarian Church on the left, the white weather-boarded Town Mill off Townwali Street, on the right, with the strange domed roof of Mr Shipden’s spacious home nearby. 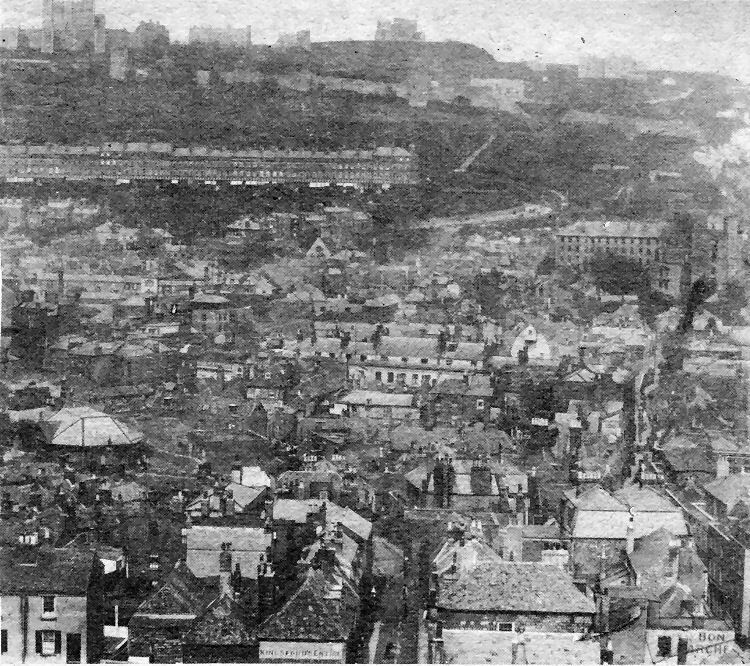 Other features include the Phoenix Brewery, old St James’ School near St James’ Church, the lofty Burlington or Imperial Hotel as it was once known, further to the right — and note the conspicuous lack of trees on Castle Hill and cent of homes below the Castle around the impressive sweep of the Victoria Park Crescent.